It made little difference that my relatives had all arrived via Ellis Island and were not a part of Hitler's Germany-- for just like now we find so many people of Middle Eastern descent being typecast as villains in Hollywood films. For every year without fail and usually in the attempt to lure more Oscar nominations, studios release a plethora of World War II pictures filled with nefarious Germans, swastikas galore, and more points of view from the unspeakably horrific global war. And while with greater education and cinematic offerings we’ve begun to catch new aspects of the war from foreign films like Black Book, Downfall, The Counterfeiters, and Nowhere in Africa—regardless of their origin, the films instantly makes the small amount of German blood in me boil and the results find me feeling irrationally guilty. Last winter was no exception as once more theaters were filled with titles concerning World War II that ranged from The Boy in the Striped Pajamas to The Reader to Defiance to the long-delayed Bryan Singer venture Valkyrie produced by and starring United Artists’ new studio head Tom Cruise. Although public perception had drastically improved for some of the previously questionable antics of Tom Cruise following his hysterical cameo in Ben Stiller’s Tropic Thunder which may have helped turn the tide for a film that was receiving negative buzz way before it opened. Whatever the case may be, in my view the movie is a success on a number of levels. Sophisticated and highly intellectual, the work which tells the true story of a brilliantly engineered plan headed up by Colonel Claus von Stauffenberg (Cruise) and several other high ranking German soldiers to assassinate Adolf Hitler in 1944 engages you deeply into its suspenseful plot. This is all done via the painstakingly historical efforts put forth by Singer and screenwriters Christopher McQuarrie (Oscar winner for The Usual Suspects) and his co-writer Nathan Alexander. Despite the fact that there were fifteen recorded attempts to take out Hitler, it was the amazingly methodical and meticulous organization of von Stauffenberg, a tight-knit group of officers and a network that expanded to seven hundred others that made Operation Valkyrie the closest the Germans ever got to putting an end once and for all to the madness of Hitler’s Nazi tyranny. Curiously and despite the fact that it's a natural plot for Hollywood fodder, the story is long overdue for cinematic treatment and it’s one that as the Blu-ray for the release informs us, McQuarrie literally chanced upon while in Germany years ago researching something else entirely. When he noticed a small memorial of four soldiers including von Stauffenberg, he discovered that Germany’s involvement in the war was not quite as “black-and-white” as it has been portrayed for decades on the silver screen. As the living grandson of the real von Stauffenberg explains, his grandfather like other men were proud to soldiers and serve their country and did not consider themselves to be part of the Nazi regime. Following an attack on von Stauffenberg’s 10th Panzer Division serving in Tunisia which left him seriously wounded (including the loss of one eye, a hand and other fingers), upon his return to his family and home in Berlin, he’s soon ushered into the ongoing plot and secret meetings among other disillusioned and disgusted German soldiers to eliminate Hitler. However and despite a tense failed attempt to simply execute via a bomb in a move spearheaded by Major-General Henning von Tresckow (Kenneth Branagh)-- with von Stauffenberg’s level-headed assurance that there must be a plan to follow Hitler's demise, they realize that it’s a far more complex proposition than simply just walking up and shooting him at close range the way most had no doubt fantasized. In addition to von Stauffenberg and von Tresckow, we meet several key players including General Frierich Olbricht (Bill Nighy), Ludwig Beck (Terence Stamp), and General Friedrich Fromm (Tom Wilkinson) and more including some like Fromm who are fearful of what would happen if it goes horribly wrong. Although once von Stauffenberg realizes that the best way to stage a coup and seriously deconstruct the military stronghold to immobilize the SS so that he and the others can work to set things right once the Fuhrer falls, the smartest yet most dangerous move is to use Hitler’s own Operation Valkyrie contingency plan against him. Bravely rewriting it, setting new details into play and forming alliances with a string of like-minded soldiers-- von Stauffenberg never makes a misstep even when he’s face-to-face with Hitler himself and has to receive his signature on the new document. Likewise, Bryan Singer doesn't miss the opportunity to use his penchant for suspense to punch up the execution of Alexander and McQuarrie’s dialogue driven script (inspired by HBO’s Conspiracy, ironically starring Kenneth Branagh). In doing so, he makes every scene a truly intense action sequence even when a pen and not a sword is used and this approach is precisely what made Valkyrie one of the most thoroughly gripping and fresh takes on the World War II genre in a long time. Although initially, I must admit that seeing Cruise playing von Stauffenberg with the same intensity and style he injects into a majority of his interchangeable American hero films was a bit disconcerting. Moreover, I was also taken aback by Singer’s extremely odd decision to have his cast go with their natural accents (mostly British with the exception of Cruise’s contemporary American fast-talking rhythm) as opposed to striving for some sort of more balanced sound for the ensemble. While the X-Men and Usual Suspects director explained in the production notes that adopting accents would most likely have distracted from the plot as a whole and he felt more inclined to just make the piece “engaging” rather than docu-drama like--given its meticulous attention to detail in filming for example some of the firing squad sequences exactly where they happened makes this deviation from authenticity increasingly hard to ignore. Yet despite this choice, the film is a tremendous achievement and one that triumphs wholeheartedly in finally shedding light on this inspiring effort by soldiers determined that by not trying to counter the Nazi regime, the world would assume that Germany was simply Hitler’s Germany and not the country in which they loved and were proud to serve. Loaded with bonus features including a second digital copy disc of the film to transfer to your compatible Apple or PC portable devices--per usual for Fox and MGM Blu-ray releases-- the clarity in sound and picture is first rate and manages to make it even more exciting than it was in the theatre. This is especially true considering that do to the intricacies of the script, we’re able to focus more on the many characterizations of the rather large ensemble involved when we have the chance to watch at our own pace and better digest information. 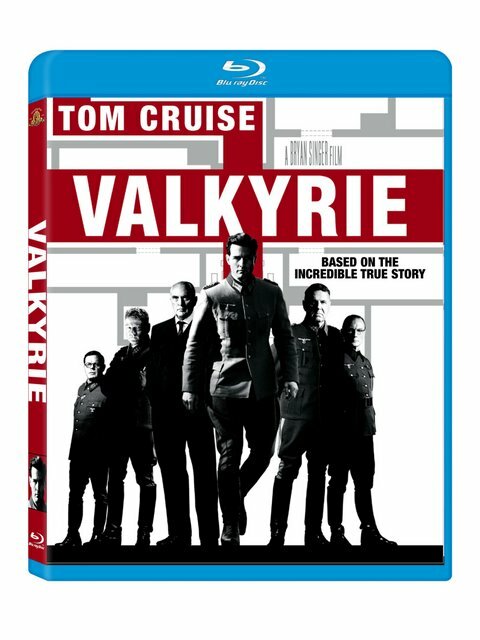 While Journey of the Valkyrie and two commentary tracks are included (including one with childhood friends and Usual Suspects colleagues Singer and McQuarrie and star/producer Tom Cruise and the other with writers) along with other featurettes that reveal just how much Cruise and some cast members looked damn near identical to the men they portrayed (see below)—the two standouts on the Blu-ray include a historical mini-documentary hosted by von Stauffeberg’s grandson called The Road to Resistance and a Q&A conversation hosted by Annette Insdorf with Singer and Cruise. At last a film that illustrates the multiple layers of the war and educates viewers who may have easily jumped to the conclusion that Germany equals Hitler and Soldier equals Nazi as depicted in countless films—while some may still nit-pick on the accuracies of certain portions including von Stauffenberg’s motive or the film’s absence of an exact plan for how the new leaders would’ve found a way to stop the devastation—it’s a stellar and involving work. Passionately made by Singer who recalls in a conversation with Insdorf that when he was growing up Jewish and obsessed with the war his two best friends just so happened to have been German born German Americans here in the states—Valkyrie honors the brave and intricate plan and similarly those involved. In other words, it reminds us once again of the important lesson that there’s so many sides to every story. And on a more personal note, after walking out of a WWII picture for the first time in my life, I finally felt not just "free to be" but very proud to be a German American.